In 1879, Thomas Jacques Martin, involved in the insurance industry, selected 20 acres which includes the land where the shed stands today. In 1889 he subdivided the land, and sold a small number of town lots. On his death in 1896 his estate was insolvent, so all his landholdings went to the City of Melbourne Bank. Early in the 20th century Emma Shorthouse bought a number of town lots along Halford Street which had been subdivided from the original 20 acre selection. These lots remained vacant land, and since she kept horses, she may have grazed them there. 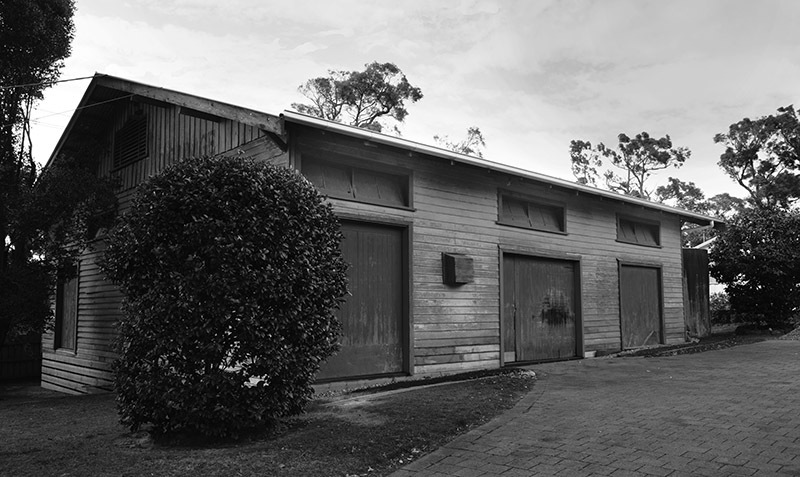 After her death in 1918, George Hodges Knox, an orchardist, bought the packing shed lot. The orchardists had recently built a packing shed near Beaconsfield Railway station. It was formally opened in May 1918. It soon became clear to them that its location was impractical. They had to cart the fruit to Beaconsfield where it was graded and packed, and then they had to return to the shed to pick up the reject fruit. It was decided that the shed had to be located closer to the orchards, and plans were put in place to physically move the shed to Upper Beaconsfield. 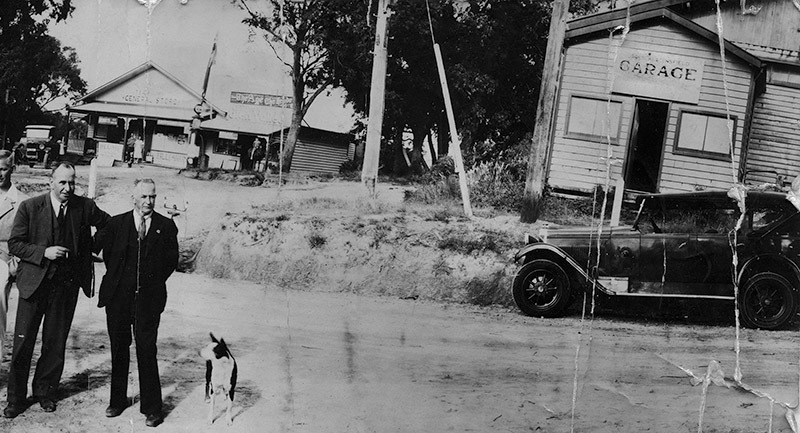 Knox may have secured the land from the Shorthouse estate to facilitate this - the land was transferred to the Victorian Orchardists' Co-operative Association (VOC) on 9 February 1921. The Pakenham Gazette reported on 28 January 1921 that the Berwick Shire Council had passed a motion, "that the engineer do whatever work is necessary to give access to and from the fruit packing shed in course of erection at Beaconsfield Upper." The move would have been quite an undertaking. The shed had to be dismantled, the individual pieces marked, so that they could be re-assembled when they arrived in Upper Beaconsfield. Looking at the beams in the garage today, one can still see markings like No. 2 Railway, No. 2 Road, and other beams have roman numerals scratched into them. It has been reported that a bullock team conveyed the parts to their new location. It was decided to use two thirds of the building at the new site, and the final third as an extension for the North Beaconsfield shed at the corner of Split Rock Road. In June 1923, the shareholders decided to liquidate the VOC, as the company had accrued a big loss. The liquidators put the packing sheds up for sale by tender in October 1923, and the successful tenderer was Judge Bevan of Pen Bryn on 12 November 1923. "Much interest is being taken in our new motor garage. The old packing shed has been fitted up with ramps, pits and benches and a large petrol shed is being built apart from the main building. This undertaking fills a long felt want as visitors or residents will now be able to garage their cars for the night or week-end at a nominal fee. Motors are gradually taking the place of our horse drawn coaches and shortening the rather tedious journey from the station." In November 1929 the Argus newspaper reported that thieves had forced the petrol bowser, and 100 gallons of petrol had been stolen. There are only two early photographs surviving. One is a postcard of Charing Cross, probably taken in the late 1930s showing the word 'Cars' on the corrugated iron roof. The other is the photograph of the 'Back to Upper Beaconsfield' event in January 1935, in which only an extension, used as an office and entrance, is visible. This extension survived until about 1970, when Ric and Wendy Thomson had to remove it. There are still signs of the extension's roof flashing visible on the wall of the main shed today. 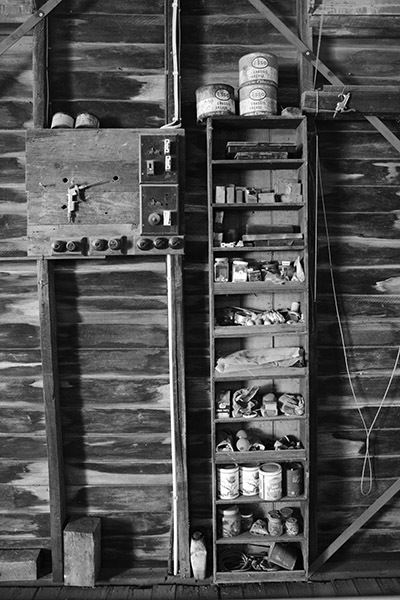 There is anecdotal evidence that during World War 2 the garage was used as a packing shed again. Doreen Bevan remembers walking past and seeing the packing shed in operation, always hoping that the packers would give her an apple. During the Second World War the Apple and Pear Marketing Board's acquisition plan was to purchase all the state's production of apples. Tom Black of Upper Beaconsfield was on this board, so you can imagine that the shed was being used for this purpose. The building, however, remained in the ownership of Judge Bevan until October 1945. The next owner was Samuel William Tetley, who in late September 1945 advertised in the Argus an auction sale of his household possessions at the 'Packing Shed'. As he had sold his house, 'Applecross' earlier in the year, he may have removed his possessions to the shed at this time. Tetley did not own the shed for long, William and Isabel Bassett, grocers, who lived in St Georges Road owned it from May to September 1946 - they moved to Belgrave shortly after. Some residents may remember the next owner. Tom Brady, a poultry farmer, residing on Wellington Road, Clematis, bought the property on 3 September 1946 and held it until his death in 1962. He was born in Christchurch in 1894 as James Frederick Tahua Flint. His parents separated while he was a boy, and his mother started a new family, Tom taking the name of his step-father, Burnside. He enlisted in the New Zealand army in 1917, but did not see active service. He was 5" 7', with a fresh complexion, light brown hair and blue eyes, but was described by the army as having a 'poor physique'. He spent nearly two months in hospital suffering from gingivitis, a painful infection of the mouth, most commonly associated with poor nutrition and a lack of taking care of one's teeth. In 1919 he married Reine Gordon, but the marriage did not last. They divorced in 1923. It is unclear when Tom Brady migrated to Australia, but it is said that he changed his name in the early 1920s, which may have been his way to escape from his marriage. The 1949 electoral roll states that he moved to Upper Beaconsfield. 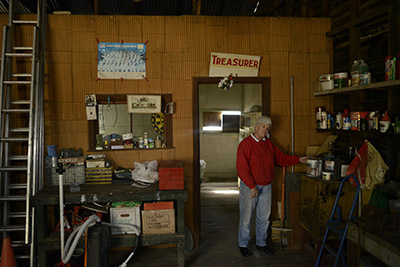 He fitted out a small corner of the shed to serve as his living quarters, with a still existing sign above it, saying treasurer. The room had a fireplace, the chimney still exists. Bill Russell, who used to manage Loveridge's store, described him as Tom 'Sport' Brady, a former garage owner from Melbourne. Stan Hamilton recalls that Tom must have been a mechanic at some time, as he owned a lot of tools that other residents did not have. Amongst other tools he had a honing machine which he hired out to the locals. Tom also bought and sold cars and trucks as a side line. Stan remembers his taxi service, and that he would take Rev and Mrs Howard-Smith, of Lo Yuan, in Split Rock Road, on tours every Sunday afternoon for a 2-3 hour drive. The elderly couple didn't drive, and this was their only way to get about. He also occasionally took them shopping in Dandenong. Stan said that Tom Brady had a 2 shilling coin glued to the floor of the garage, and watching as customers trying to conceal it with their foot, waiting for Tom to turn his back so that they could pick it up. It was Tom who had the last laugh. In late 1961 Tom was admitted to Royal Park Psychiatric Hospital where he died in July 1962. In his will he left most of his property, valued at about £10,000 to his sister in New Zealand, except for his 1956 Holden car, which he gave to Muriel Dowling, a teacher, who lived on Salisbury Road. George Thomson, owner and resident of Cormore Tea Rooms (previous name of the milk bar) had been Tom's friend. George became the next owner of the packing shed and Brady's other landholdings. After George's death in 1965, his widow Mag, and son Ric, moved to the packing shed, where Mag would stay in a caravan, and Ric in Brady's room. In 1967 Ric Thomson built the existing house and a granny flat for Mag. The packing shed was used as a private garage. Today the shed is privately owned by Wendy Thomson, who has recently re-roofed the shed, an improvement that will extend the life of this historic building, tied to the history of Upper Beaconsfield's extensive orchard past, and the transition from horse and cart to motorised transport.